Functional foods, nutraceuticals and degenerative disease prevention PALIYATH G.
In recent years there has been a tremendous increase in the awareness of dietary habits and their influence on maintaining good health through disease prevention. Thus, there has been considerable popular demand for the health-enhancing, physiologically active components of functional foods, as consumers have become increasingly aware of the important link between diet and health and the vital role that diet plays in combating chronic degenerative diseases such as cancer, type II diabetes, cardiovascular diseases, Alzheimer's, and autoimmune diseases. Functional foods and functional food ingredients/nutraceuticals and their influence on health have become common in scientific and popular literature. Apart from the common nutrients and vitamins that are obtained from food that form the building blocks of the human body, nutraceuticals present in many commonly consumed foods exert specific health or medical benefits, including the prevention and, in some cases, treatment of disease conditions, which enables their categorization as functional foods. 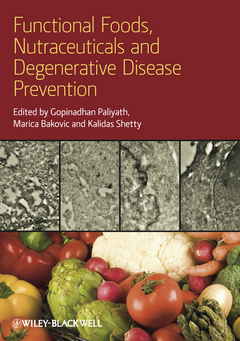 This book reviews the current science of functional foods and nutraceuticals, focusing on their mechanisms of action in the human body that lead to disease prevention. Numerous chapters deal with various functional foods in terms of their efficacy, and highlight the biochemistry and molecular biology of the disease prevention process rather than simply compiling the benefits of these food products.